In your circles, do you have “inside” foods? You know, like foods that are kind of like an inside joke, except they’re no joke at all/ A food that when you mention it, everyone gets this knowing look on their faces, because they understand that the food is more than a food- it’s a memory? For example, if I mention say, “Pokey sticks” to my friends from college, it’s followed by a chorus of, “Oh, pooooookey sticks.” Not because they are really all that good in the cold clear light of day, but because they evoke so many fond memories of cheesy, garlicky dough in the wee hours of the morning after a rather long night out. It’s not about the food, it’s about being transported to happy times with people you love. German pretzels are one of those things in my family. Well, to be fair, they are, but without the part about them not actually being that good. Because unlike Pokey sticks, an authentic German pretzel slathered with yellow, creamy butter is legitimately one of the best things that you may ever eat. Just thinking about these pretzels conjures up memories of a family trip to Germany, to the town where my grandma grew up. It was a great trip for many reasons, with lots of happy memories. But one of the best memories is that of my mom walking down to the Bakerei every morning and bringing back warm, fresh-from-the-oven pretzels. We’d break off hunks, slather them with butter, and call it breakfast. Heaven. The hard part about foods that hold such strong memories is that they can never really be recreated. You can try, and you may even get really close, but it never seems to be quite as delicious as you remember. But it sure is fun to try. 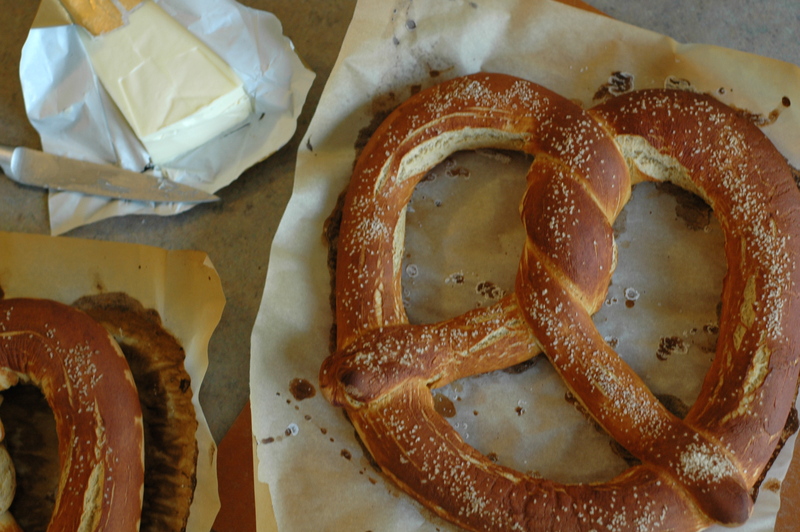 This recipe for German pretzels is the closest I’ve tasted here in the U.S. Most pretzels that you get in this country are of the mall food court variety (which have their virtues, to be sure, but aren’t in the same realm as the real deal) and are fluffy, buttery concoctions. These, on the other hand, are chewy, a bit dense, dark, and lightly salted. I made two pretzels as the recipe told me I should. However, I recommend making 4 or 5 smaller pretzels out of this batch of dough. The huge size of these was novel, but not altogether convenient. Heat a baking stone in an oven to 500°. 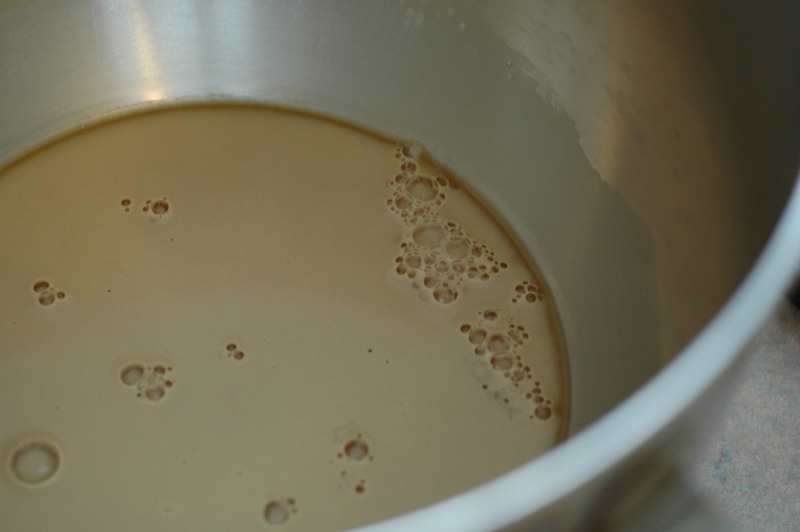 Stir together syrup, yeast, and 1½ cups warm water in a large bowl, and let sit until foamy, about 10 minutes. Add butter, flour, and salt, and stir until dough forms. Transfer to a lightly floured work surface, and knead until smooth and elastic, about 8 minutes. Halve dough, and working with one piece at a time, roll dough into a 4′ rope, about 1″ thick. 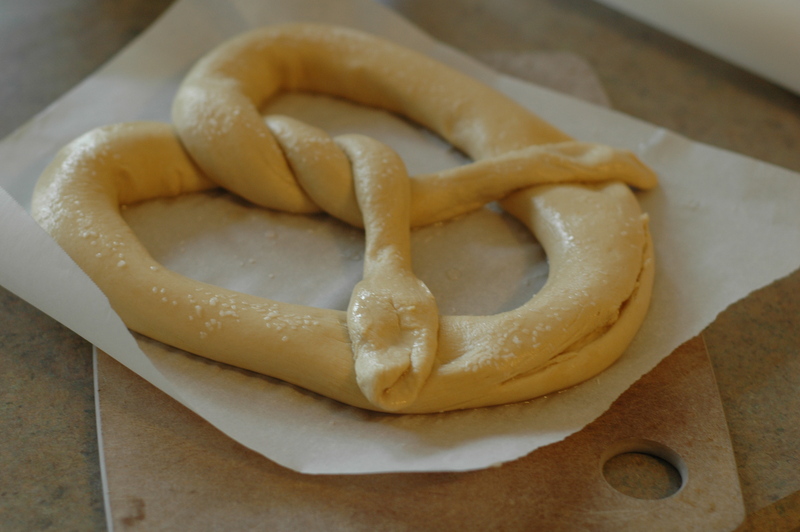 Transfer rope to the bottom edge of a sheet of parchment paper, and keeping the center of the rope on the paper, pick up both ends, cross one end over the other, about 2″ from the ends, and twist; attach each end to the sides of the pretzel. Repeat with remaining dough, and set aside to rest for 20 minutes. In a small saucepan, bring baking soda and 1 cup water to a simmer, stirring constantly until baking soda dissolves. 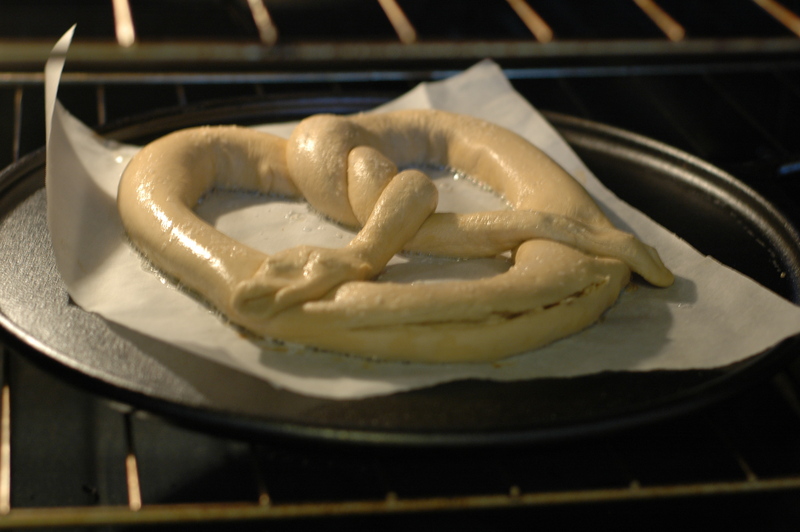 Then brush each pretzel generously with the baking soda solution, sprinkle with coarse salt, and using a sharp paring knife, make a 6″ slash, about ¼” deep across the bottom edge of the pretzel. 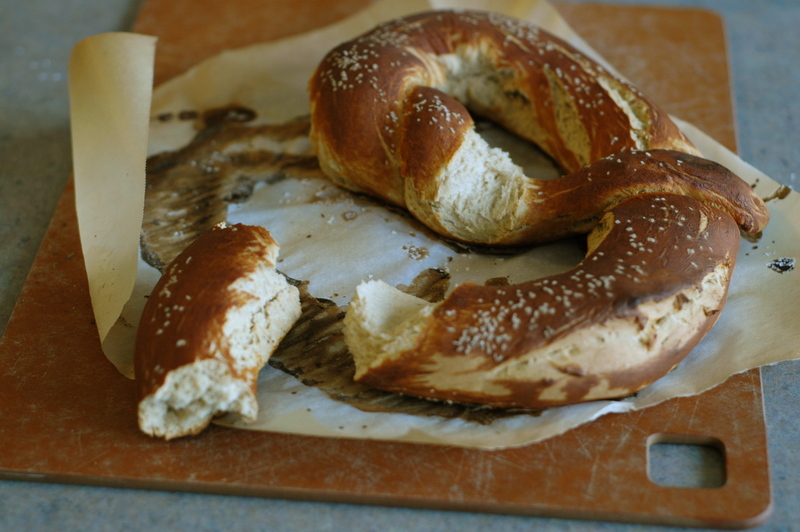 Working one at a time, slide pretzel on parchment paper onto the stone; bake until dark brown, about 15 minutes. Repeat with remaining pretzel. Let cool for about 10 minutes; serve warm with butter. I ate one of these pretzels and they were delicious! We oohed and ahhhhhed and begged for more! Splurge and eat these with high quality butter…. might as well take these over the top to GREAT!